Like a photo for your ID, CV or other profiles, we want to draw ourselves in this assignment as a first step for your business card. Observe yourself in the mirror or look at a favourite photo of yours. Look at the facetool-kit and try to identify what head form, mouth shape etc. you have. 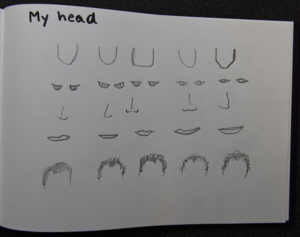 Then: Which details of your face do you want to visualise and what type are you? This is more about what you want to represent than how you actually look like. Take a pencil and try drawing parts of yourself several times as a warm-up. Finally, take your favourite pen and combine all of the elements. "I first tried to experiment with my head shape and components. I sketched a whole page of alternatives and only afterwards started to sketch the overall portrait. I used a photo in order to be able to really look and understand how my eyes, mouth, hair, etc. look. Furthermore, I did not try to have a copy or photorealistic representation of myself but rather a good match of how I see myself (or at least: a portrait that I could live with…). Through these experiments – even though the portraits are not perfect – I learned something about the essential features of my head/face: it is not too round, my eyes are rather thin, definitely not too round or big, my chin is quite edged, my lips are rather thin and not too curvy, my forehead is quite dominant and my hair is short and quite high up. 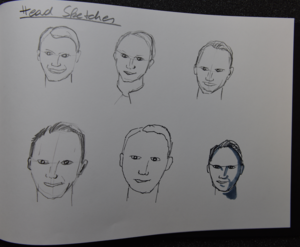 These are some essential features I can from now on always use in order to create a very fast sketched mini-me. Even if the sketch will not totally represent me, it will still represent the “my type of portrait”. I was happy with those insights and started working on the further parts of my business card."